Before i start I will say i could very easily of written 3 or 4 posts about race week alone, however I’m going to try my best to condense it into one. I hope….. 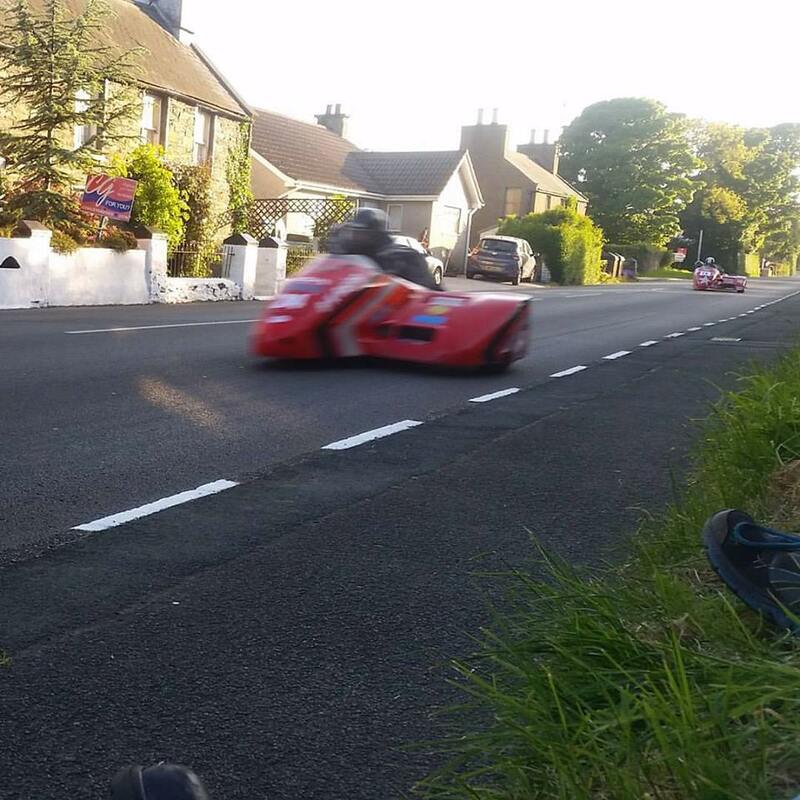 So, the Isle Of Man Tourist Trophy. The worlds most dangerous road race. 37 3/4 miles Of country lanes, tight hairpins and open mountain roads averaged at 130+ mph. Over 80 thousand people from all corners of the world travel days or weeks for two weeks of high intensity racing. This is personally my 4th time visiting the island for the TT races, although my last visit was 9 years ago for the centenary celebration. A lot has changed in a lot of ways. I arrived at 5am on the 1st of June, so half way through practice week. I’m not even going to deny it we drove straight off the ferry and headed for the track. A 5am lap of t he famous mountain circuit in nothing other than a VW T4 transporter. Not surprisingly the sun was up and so were the bikes, I quite enjoyed the steady stream of machines sailing past us while we familiarised ourself with the stunning scenery. Following our lap we made our way to Onchan, this is where we camped on the football pitch for £10 a night. Perfectly acceptable accommodation a nice quite site by the glen. One little down side, if your a bit self conscious you may want to find somewhere that doesn’t have communal showers, its not very often you get them to yourself. Im not overly sure why no one seemed to camp near us, but I’m not about to start complaining. I can’t begin to describe the racing, unless you’ve been there first hand and experienced it there is no way to comprehend the experience. There are grandstands to watch the racing from, for a fee of course which is by no means small, I mean £50 for the grand stand ….. ouch. Which by the way is most definitely not the best place to watch the racing. I’d much rather go find somewhere to plonk myself right on the edge of the track where in places if you were to reach out too far the riders would be taking your arm! ( if you go to my Instagram there are more videos and pictures) You’ll rarely be alone in any spot but a track of this size means unless you are in a few highly popular spots you’ll have no problem being directly track side. Everyone says it and I’m not going to be any different, These men and women who mount their machines and let rip around the mountain course are a breed of there own. It take a special kind of person to get on a motor bike or motorbike and sidecar knowing they will soon be skimming bushes and stone walls at 150 mph+. I’m trying not to go on about the racing because i could quite literally go on for ever but i think you have to experience it yourself, I don’t have the literacy skills to do any justice to how incredible it really is!. So on that note i shall talk about a few other things you can do when the racing isn’t on. Of course anyone that knows the TT knows Mad Sunday, which funnily enough isn’t quite as mad anymore . Saying that there is plenty to do! personally we went to Ramsey sprint. A run what you brung drag racing competition on the sea front at Ramsey. Quite cool really you get professionals on highly developed drag bikes and you average Joe who just wants to take his or her bike for a good blast! This is also where we stumbled across this lovely Mike Hailwood Honda replica in the bike park. Actually later turned out to be one of our friends bikes, but thats a slight tangent! Once we had spent a few hours in the intense sun, we made our way to peel for peel day. Here you find sand castle building, yet hundreds more motorbikes to wander round, several incredible manx ice cream shops and mini moto racing through the streets. Our two bikes that won peel custom competition! ve closed. I don’t mean to put a negative light on what is one of my favourite places on this planet, however the reality is there is a much calmer atmosphere in todays TT. I will quite happily point out however the merchandise and such like are at a much higher standard than i remember real quality clothing and a huge range. Also some stunning photos and posters available at every turn. A bit of advice if you wish to experience the worlds best road race. Firstly. If you haven’t booked by the end of practice week for next year, you probably aren’t getting the ferry crossings you want. Have somewhere to stay before you go. Most campsites are a case of turn up and pitch a tent but if you want a roof over your head and a warm shower theres a very slim chance you’ll get one on a arrival. Do your research, for example if you have a CBT in England, it is not valid on the Isle Of Man. If you do a little research in advance its a lot easier to find some amazing places to watch the racing from! Most importantly though, much more important than anything else. Stay safe, its called the most dangerous race in the world for a reason and every year people get hurt and unfortunately loose their lives. This won’t change its the nature of the beast but everyone knows the risk then they climb onto a motorbike. On a much happier note, not that i expect they will read this i want to congratulate Daniel Hegarty with RTR Racing who is from the village next to me and won the privateers trophy. Its just a matter of time until he is fighting in the top three and quite frankly I’m looking forward to watching him continue growing as a rider. I would like to take this moment to just give a quick mention about all the incredible people who over the last 109 year have lost their lives to the mountain circuit. My heart and thoughts are always with the families and friends affected.